Hi all. I am building the Prospector and I am stripping now. I am coming up to the top of the stem and am having difficulty bending the strips. Any suggestions. I am thinking of steaming the strips. Two questions- if I steam the strips will the be to wet to glue and does any one have any suggestions as to how to build a steamer? I suppose steaming is one solution. You will have to clamp the steamed strips in place until they cool and dry and then glue them. Steam boxes can be made of plywood or a length of PVC pipe. Electric tea pot is a typical steam generator. The other solution, and the best IMHO, is to let the strips run out to the keel where they can without an extreme bend and fill in the resulting gap with short, cut to fit strips. In the future this situation can avoided by running the first strip at the gunnel line only on the middle five molds(center, #1s and #2s) and then letting it run out straight. 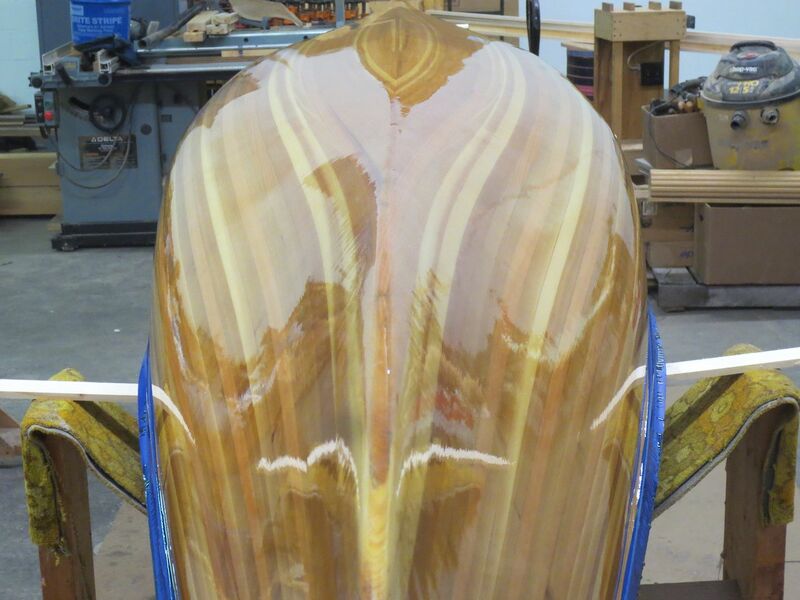 You will have to fill in the peak of the hull below this strip, but the strips will run better, without the extreme twisting, as you approach the keel. I am trying to visualize what you mean, any chance of a quick pic, they are so much more useful ... the explanation and question you offer sound perfectly reasonable in your mind I am sure, but you get to see what you are talking about and it isn't so obvious on this end. However, if the strips won't bend without breaking and you need to glue them, steaming would not be an option IMO. The easiest way to "limber" up a strip is to make it smaller ... I know that sounds crazy, but you can just do up some 3/4 or 1/2 strips to fill in that area. They will flex a lot more and likely handle the bend you need. If you do post a pic, we may be able to offer better ideas. This is typical of Stapleless construction, not to mention, keeps the strips true to the forms ! At this point, I'd start using staples, until you get into the Football. In fact staples don't bother me, so normally this isn't an issue. Curious Bombard ! What wood are you using for your strips, and what thickness ? I'd Sly away from Water steaming strips ! Some will use a heat gun, but I'd be concerned about Burning the strip, especially if you B&C your strips ! Keep your paddle wet and your seat dry! I actually ran some tests with a heat gun Jim, you are correct it isn't very effective. I could put slight bends in wood, but no where the amount that steam provides and there was a lot more spring back. This was a fairly controlled test with thermometers and a hot box to make sure I was actually heating them up ... but IMO a waste of time. Good to know Brian ! Guess a guy could Borrow the Wife's Steam iron ? Might end up buying her a New one ! But it might be enough, and would concentrate the moisture and heat at one spot ! Again I haven't tried this, just an idea . My previous pic was just to illustrate, how much Torque is put on a 1/4"x 3/4" Cedar strip. And yes, I used staples, in this area ! Given that this is a Prospector ... that's sort of a mainstream, straightforward build, there shouldn't be any torque issues, that why I asked if the original poster could put up a few pics so we could see what he is doing. That way we could offer something more than speculation. As far as the hair steamer etc. I have given up on shortcut methods to bend wood, I f I need it done, I will full on steam it ... I am starting to think the steam does more than heat the wood (that is heat tranfer agent) I am thinking it has to do more or heat should work on it's own and it hasn't for me. I'm of the same opinion as Cruiser...I wouldn't think there would be any unmanageable torque to overcome on the curves of a prospector that would require steam (assuming a species of western red cedar or similar), unless the curve of the first strip from stern to bow was set at an extreme curve at the beginning of the stripping process (i.e. the first strip was laid to follow the curve of the gunwale instead of following a more natural arch). Would need to see a photo though. I'm building staple-less, and back when I was working on stripping the hull, I used band clamps/ratchet straps wrapped around the canoe and under the strongback at each form to tame the twist and power through the stripping process around the bilge. Worked like a charm and would do it that way again in the future. Sometimes staples won't even hold that twist. You're only able to do this at the form location though, and not between the forms, but it should give you enough leverage to twist a 3/4" x 1/4" strip where it needs to go.